Dog lovers will adore decorating their Christmas trees with this porcelain dog motif ornament. 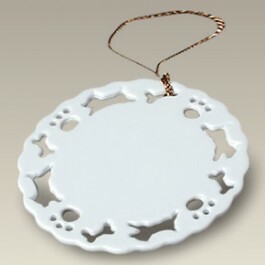 The 3" round ornament features openwork dog, paw print, and dog bone shaped cut outs surrounding a center area for decorating. Includes a string for hanging. Made in China.